Summary: Daniel’s prophecies about Alexander came true. Note: This is the second article in a series on Alexander the Great. PREMISE: Alexander the Great was predicted in the Bible. PURPOSE OF ARTICLE: To show that the prophecies in Daniel pertaining to Alexander were fulfilled accurately. Besides the fact that atomic bombs did not exist and a first world war had not even erupted yet, this would be a preposterous situation. You might think to yourself that no one can predict the future – at least, not until you see what happens in the book of Daniel. The goat charging the ram and breaking his two horns is symbolic of Alexander destroying the mighty Persian empire at the battles of Gaugamela and Issus. I’m a history geek, and I could go on for hours about the incredible strategy used by Alexander at these two battles, but for the sake of time and conciseness, suffice it to say that Alexander toppled the dominant empire of his time, and he did it even when outnumbered five to one. The prediction about four kingdoms arising from the breaking of the horn is astounding because it matches what happened upon Alexander’s death. In 332 B.C., Alexander died in Babylon at the young age of 32. Conspiracy theories abound regarding the cause of his death, and to this day, no one knows why he died. When asked about who should succeed him, it is thought that he said, “The strongest.” Since no one knew who “the strongest” was, Alexander’s empire was divided to four of his generals: Cassander, Ptolemy, Antigonus, and Seleucus. Hence, just as the Bible predicted, four kingdoms arose. These Persian kings (after Cyrus the Great, who was king at the writing of this prophecy) were Cambyses, Gaumata, Darius I, and Xerxes I. True to the Bible, Xerxes attempted to conquer Greece, but he failed.3 Ever heard of the Battle of Marathon, where the runner Pheidippides ran for 26 miles to Athens to deliver news about Greece’s victory? 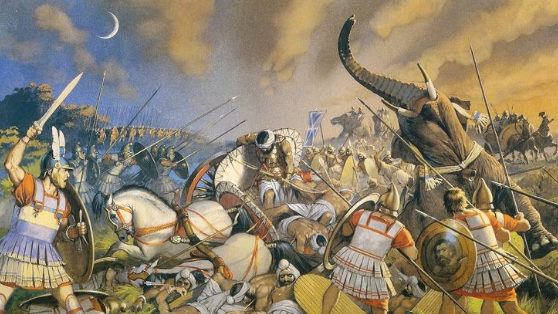 That battle occurred during the Greco-Persian Wars described here in Daniel 11. Sound familiar? It should, because this is speaking again about Alexander, who indeed was “mighty” and ruled with “great dominion”. And the prophecy about the kingdom being divided into four smaller kingdoms is identical to the prophecy of Daniel 8. Daniel 11 is particularly remarkable because it goes on to predict Antiochus IV Epiphanes, king of the Seleucid Empire who arose from one of the four kingdoms.4 The Bible accurately predicts his conflicts with Egypt, his brutal oppression of the Jewish people, and his gross desecration of the Jewish Temple (he sacrificed a pig on the altar). Every prediction made in Daniel 8 and 11 came true. Not a single detail was described incorrectly, and not a single iota has been invalidated historically. There are details that no one could have guessed and gotten right. Now, if we can only verify the historical anecdote presented by Josephus (presented in our last article) or show that Daniel was written before these events occurred, we can conclusively point to a prophecy that is not a hoax. Walbank, Frank W. “Alexander the Great.” Encyclopædia Britannica. Encyclopædia Britannica, Inc., 7 Apr. 2015. Web. 25 Mar. 2017. Mark, Joshua J. “Alexander the Great.” Ancient History Encyclopedia. Ancient History Encyclopedia, 14 Nov. 2013. Web. 25 Mar. 2017. Huot, Jean-Louis. “Xerxes I.” Encyclopædia Britannica. Encyclopædia Britannica, Inc., 18 Jun. 2015. Web. 25 Mar. 2017. Volkmann, Hans. “Antiochus IV Epiphanes.” Encyclopædia Britannica. Encyclopædia Britannica, Inc., 13 Mar. 2003. Web. 25 Mar. 2017. Next time on Against Doubt! Antiochus Epiphanies, the little horn arises from one of the four kingdoms! Was it by force, cunning strategy, silver tongue and cheek, a combination of the above? Stay tuned and find out! Only on Against Doubt! Love this ad! 🙂 I can’t wait to continue the series. Thank you so much! I appreciate the encouragement. Great article, Vinh! It is incredible to see the power of God unveiled throughout history, and to realize how he uses ordinary people to display his extraordinary glory. Amen, Eliana!! God does use ordinary people for his glory, and I think it’s awesome that, looking back in the annals of time, his fingerprint is still there.